Where Shall I Eat Pizza? 'Rustic' - tomato, mozzarella, spicy soppressata, roasted pepper at Love and Dough. I probably ate some of the best pizza of my life in Dumbo Brooklyn at my now beloved Love and Dough, the crust tastes like sourdough and it brought a tear to my eye it was THAT good. JUST LOOK AT THE CRUST. It’s coeliac friendly with separate trays and cutters etc. This is my number 1 tip so definitely head here no matter where you stay. Dumbo is an amazing part of Brooklyn, with views of the Bridge and Manhattan so you definitely won’t be disappointed with a visit! Where Shall I Eat Brunch? 'El Camino' Poached egg, avocado, pulled pork carnitas, tomato, fried tortilla (subbed for muffin) at Egg Shop. One of my two Manhattan recommendations is Egg Shop for a perfect gluten free English Muffin. Be wary of anything deep fried here as they share fryers and definitely make sure your muffin is being toasted separately and then GO MAD. I had the carnitas and switched out the tortilla because I am obsessed with mexican food and it was TASTY. The muffin was so buttery and melt in your mouth. Loads of different GF items on the menu so get yourself along. Where Shall I Eat a Doughnut? I can hear you thinking.. but gluten free doughnuts aren’t a thing, or gluten free doughnuts are gross. Well let me tell you, gluten free doughnuts, cakes, biscuits, cupcakes, eclairs (yes I tried them all), are delicious from Erin McKenna’s completely vegan and gluten free bakery. Zero cross contamination, lovely service and SO MUCH choice, I definitely went overboard but it was DELICIOUS. Where shall I eat Arepas and drink margaritas in the sunshine? 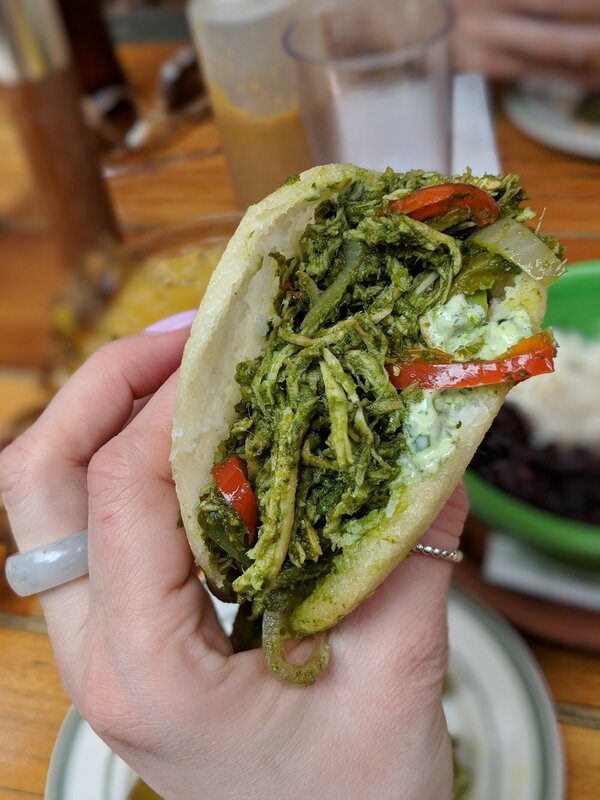 Definitely Caracas Arepa Bar in the Williamsburg area of Brooklyn. It’s corn flour so you don’t have to worry about bread contamination but stay away from the fryers - they are not coeliac friendly. They have a great little garden, the drinks and reasonably priced and the food is delish. Check out my chicken, pesto (I know whaaat, but it was delish) and chilli one. It’s a great spot for the Summer. Where shall I eat vegan food? Tried and tested vegan chain by CHLOE is dotted around the city (Manhattan and Brooklyn), so is an easy stop in place for weekend brunch or weekday lunch. The GF bread is good, fries are air fried (so no contamination) and the mac n cheese is extremely tasty. What about cookies and cakes? I stayed in the Green Point area of Brooklyn (highly recommend The Franklin Guesthouse) and round the corner was the lovely Ovenly. Separate areas for GF and no tongs, just picked up with bag so treat yourself! HEY, coffee is always gluten free.. Yes, but it’s not always delicious. If you’re in Manhattan and you love a flat white try City of Saints - best flat white of my life. If you’re in Dumbo to try Love and Dough, grab a coffee from Brooklyn Roasting Coffee. If you stay in Green Point (Brooklyn), head to Home Coming for a coffee in quaint settings or to Budin for a flat white in a lovely garden area. HEY, WHAT ABOUT ALL THE GLUTEN FREE PLACES IN NEW YORK I’VE SEEN ON INSTAGRAM?! I didn’t get the chance to go to any recommendations (except for Love and Dough, thanks @gfreeveggie) but here are two that I was told to go to and are coeliac safe. I won’t recommend any others because I don’t like to point to somewhere that I haven’t been myself, both of these are 100% GF. So what shouldn’t I do.. If it says gluten free on the menu STILL ASK, no one seemed to understand separate frying or toasting so please be careful. 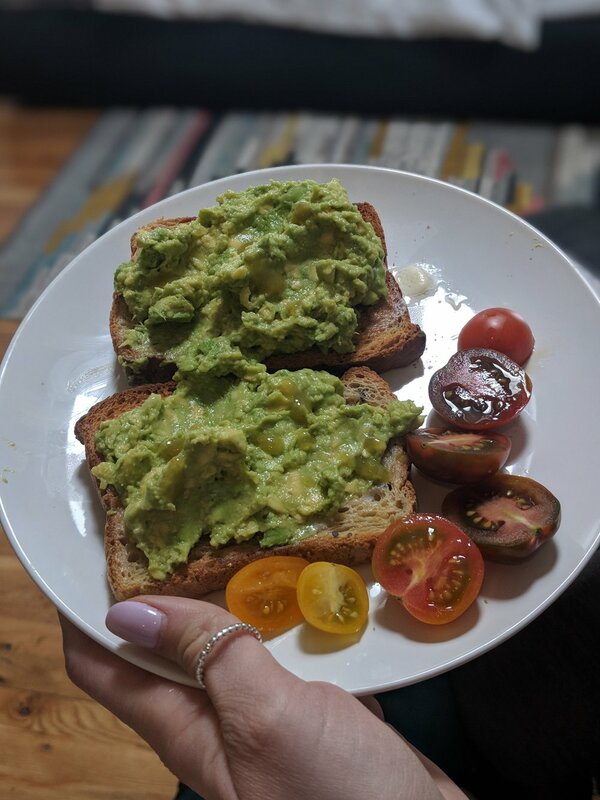 For breakfast I stayed in my hotel/guesthouse (with a kitchen) and made avo toast (the avocados are outrageous) because of this. I was only staying in New York for a few days but hopefully some of these tips will help you on your trip.